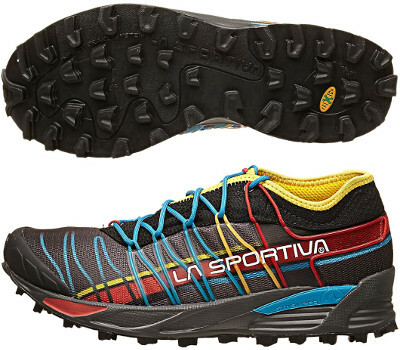 La Sportiva Mutant are neutral trail running shoes. The eye-catching La Sportiva Mutant is a versatile trail (or "mountain" as people from La Sportiva name it) running shoe. As an evolution of the Q-Lite and compared to other La Sportiva models, the Mutant is intended for not so long distances as the Ultra Raptor and for muddier terrains than more agile Bushido. Besides the usual aggresive look from the italian brand there are several interesting features when looking at Mutant's upper: SpiralTongue provides sock-like fit and combined with small integrated gaiter prevent small stones and mud for getting inside. FusionGate™ technology delivered a custom fastening through heat molded cords. 4 mm Ortholite® footbed delivers not only extra comfort but also enhanced moisture management system. The Mutant features reliable EVA injected (MEMlex) midsole with stabilizer for improved comfort in long runs. Well known Frixion XF outsole with Impact Brake System increases shock absorption and traction on any kind of terrain although it raises several concerns about durability.